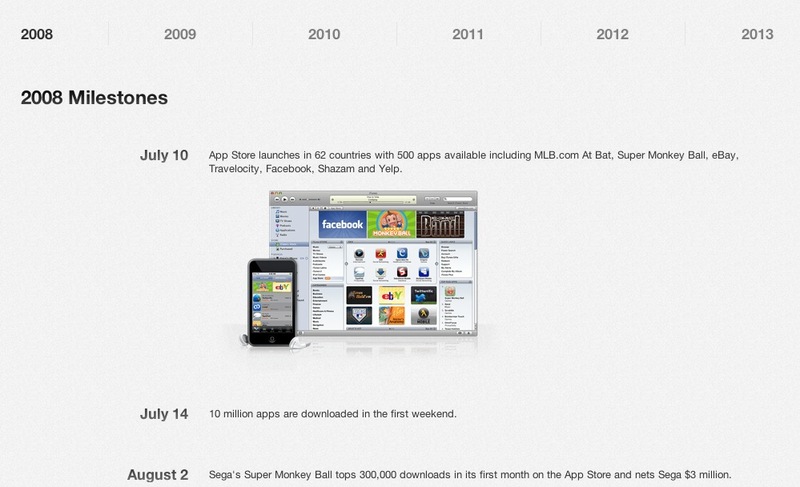 Apple has launched a celebration of 5 years of the App Store with a special timeline section and app sales today. You can find both the timeline and sales by opening iTunes or clicking this link. Apple recently surpassed 50 billion downloads of apps from the store, noting that it should hit 75 billion by the end of the year. A bunch of apps that are normally paid have gone free for the promotion including Infinity Blade II, Superbrothers: Sword and Sworcery EP, Badland, Tiny Wings and Where’s my water? Other apps that previously commanded $19.99 to download, such as Traktor DJ for the iPhone or iPad are also now available to download for free. In addition to offering free games and apps, Apple also posted a timeline image of its progress since it was first launched marking its milestone achievements. At WWDC 2013 Apple announced that the App Store was home to more than 900,000 apps and that it had paid out more than $10 billion to developers since it was first launched. Notably, Google announced that it had hit 48B apps downloaded from the Google Play Store in May as well. We investigated how the companies tabulate those numbers and concluded that those numbers are on relatively even footing, demonstrating Google’s somewhat quicker uptake. iOS still far exceeds Android when it comes to paid applications, however.